Even with a terrific project management program in place, problems can arise to derail your team's hard work. The last thing you need in the heat of battle is academic theory. You need field-proven fixes, practical answers to urgent questions, and simple strategies for navigating around obstacles. 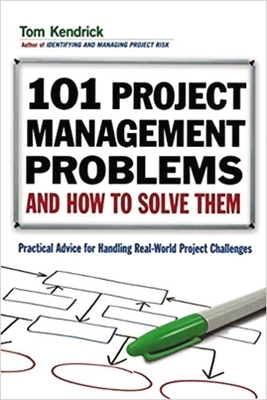 "101 Project Management Problems and How to Solve Them "explores a wide range of these real-world challenges, including how to: - Keep a project on track despite unavoidable interruptions. - Prevent unreliable outside collaborators from jeopardizing the entire project. - Manage project teams who have little or no project management experience. - Make up for lost time without cutting corners. - Succeed in the face of threatened budget cuts. - And many more. Filled with plan-ahead strategies as well as on-the-fly solutions, this helpful guide is the ultimate project adviser and on-the-job troubleshooter in one. TOM KENDRICK is an internal project management consultant for Visa Inc., and a former project management executive for Hewlett-Packard. He is the author of "Identifying and Managing Project Risk," "Results Without Authority," and "The Project Management Tool Kit."